1. Tone of writer: Galatians and 2 Timothy. This is perhaps the two extremes in Paul’s writing. In Galatians Paul is very upset about the false teachers. He forsakes convention to deliver a stinging astonishment statement in 1:6 instead of the standard thanksgiving opening. In chapter 3 he is questioning who has cast a spell on the believers who he obviously loves deeply, but is so concerned about. And by chapter 5 he makes the strongest remark in all of his writings, again about the false teachers. Compare that with the sensitivity of Paul in his later letter to Timothy, beloved Timothy. He writes about false teachers there too, but the tone is completely different. He is concerned, he is deliberate, he is urgent, but he is gentle at the same time. Paul wanted both letters to get through – one as a wake-up call, the other as an encouragement. 2. 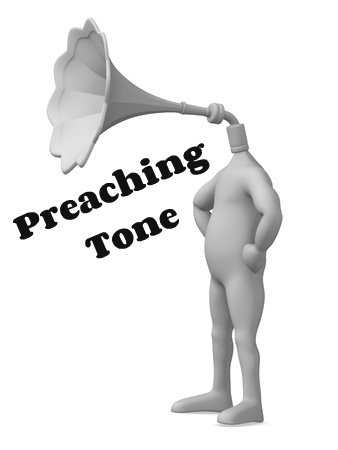 Imposed tone of preacher: Hebrews and Ephesians. One example of how we can impose a tone that contradicts the material we are preaching can be seen when we think about these two letters. Hebrews is a sermonic message designed to encourage and warn. It startles. It urges. It paints pictures and explains a small number of specific Old Testament texts in such a way as to urge the believers on. But preachers can bring in a foreign tone – one of theologically dense intensity that loses the energy of the original letter/sermon. Or think about Ephesians. The opening sentence in 1:3-14 is abundant in language choice. The grace of God seen in the choosing, the giving of the Son, the giving of the Spirit, is lavished on believers. And what might we do with it? To be honest, too many of us turn it into a sterile detailed presentation of a theological doctrine triggered by one or two key words in the passage. I wonder if the Ephesian elders would recognize our presentation of it? Tone matters. The tone of the text. And the tone of the preacher.